Queens, the easternmost and largest boroughs, is diverse with approximately 138 different languages spoken and 46% of residents born outside of the United States who represent over 100 different nations. It sits on the west-end of Long Island. It is home to JFK International Airport and LaGuardia Airport. 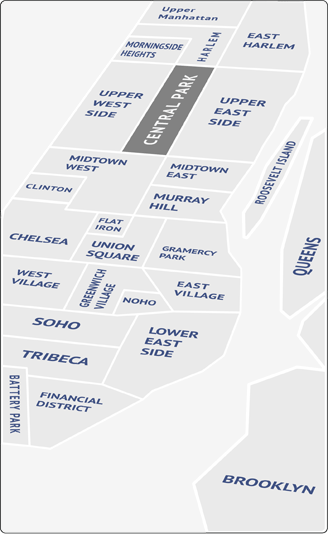 The borough is comprised of dozens of unique neighborhoods, each with its own distinct identity. The borough's architecturally varying neighborhoods offer many different dwellings from large single-family detached homes to high-density apartment buildings. Queens is home to restaurants representing the cuisine of many cultures, particularly Chinese, Colombian, Ecuadorian, Filipino, Indian, Haitian, Korean, Mexican restaurants, along Roosevelt Avenue; Dominican food in Corona and African-American cuisine in Jamaica. Other cultures, such as Greek, Arab, Latin American, and Southeast Asian, have prominent standings in Astoria. There are several Bukharian restaurants serving Central Asian food Forest Hills and Rego Park. Queens is home to the New York Mets baseball team, the US Open tennis tournament, and Aqueduct Racetrack. In Jamaica Queens there is The Afrikan Poetry Theatre and western Queens is more of an artistic hub, including SculptureCenter, the Flux Factory, the Noguchi Museum, Socrates Sculpture Park, Fisher Landau Center, Dorsky Gallery Curatorial Programs, and the Museum of the Moving Image. The P.S. 1 Contemporary Art Center is one of the largest and oldest institutions in the United States dedicated solely to contemporary art. Queens is home to many other cultural institutions. Public parks offer hiking and bird-watching in Jamaica Bay or stroll the grounds of the World's Fair in Flushing Meadows Park. Surf in the Rockaways, or visit Fort Totten in Bayside.